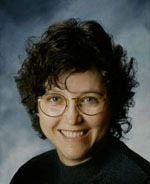 Author Thelma Giomi is a novelist, award-winning poet, and a psychologist. She used her personal experience with chronic illness and as a caregiver, as well as her years in the medical arena, to fashion her newest release, Shatter My Heart (2018). You’ll find Thelma on her website ThelmaGiomi.com and her Amazon author page. What is your elevator pitch for Shatter My Heart? 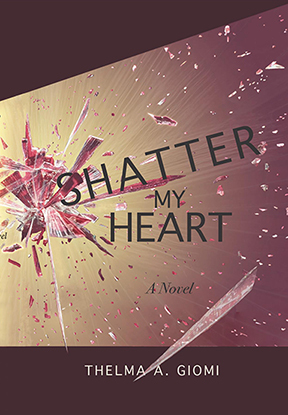 Shatter My Heart is a dynamic story that immediately immerses the reader in the lives of four friends. Individually and together they face and overcome some of life’s most devastating challenges—invisible illness, loss, infidelity, and the demands of commitment to each other. They emerge from these challenges with poise and compassion to become the heroes of their own lives. Lauren loves working as a psychologist in a medical setting but is haunted by persistent and undiagnosed symptoms of her own. She remains a steady force finding ways to live with her illness and its consequences while finding delight in life and never losing her compassion for others. Emotionally wounded surgeon Ian Blackburn is running from his own sense of compassion. He is tormented by his feelings of helplessness to cure his wife or care for his son. Ian and Lauren’s love story is a compelling drama filled with shifting moods and events as Ian spirals to near self-annihilation. Lauren’s best friends, Paul and Nikki Fiori, live their lives with passion, humor, and an acceptance of life’s challenges. The couple provide a sanctuary for Lauren in her darkest moments. What themes do you explore in the book? One of the major themes pervasive in Shatter My Heart is that taking care of each other is the only thing that really matters in life. Nikki, Paul, and Lauren all demonstrate this throughout the book in their care and commitment for each other. Another theme is that “reality cannot be fooled.” As Lauren’s symptoms (like many with “invisible illnesses”) are dismissed or trivialized by the medical profession and others, Paul reminds Lauren of the reality of what she is experiencing and urges her to not give up. Throughout this novel Lauren and others must find in themselves what Camus calls “an invincible summer.” As challenges and crises occur in their lives the characters in this book find ways to live not only constructively with the challenges, but with an ability to continue to find pleasure, shared happiness, caring and compassion. The novel also addresses who a healer is and the consequences of running from fears and vulnerabilities. One of my challenges was to incorporate into the story my own experiences and those of others living with invisible illnesses while letting Lauren find her own voice and speak her own truth. Another challenge was in researching Lauren’s different medical issues by interviewing professionals and patients to provide authenticity to the scenes and events. For me, as with anyone living with a chronic illness, writing this novel posed a constant need to balance writing times with the physical manifestations of Systemic Lupus. What was the most rewarding aspect of writing Shatter My Heart? The most rewarding aspect is the emotional feedback I have received from readers. It affirms my vision and hope for this book—that it offers the reader an engaging story with complex and compelling characters and that it reaches a wide and diverse audience. 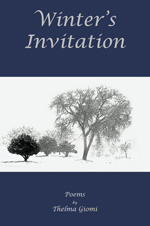 Hearing from a variety of readers with their different experiences and points of view has affirmed that this book offers compassion to those living with chronic illness as well as insight and understanding to those who have not experienced the life challenges and consequences of such illness. Many reviewers have said that the story is “well told.” That is a goal we storytellers strive to achieve and perhaps one of the best evaluations one can receive. The story emerged while I was listening to “Total Eclipse of the Heart” by Bonnie Tyler. I envisioned a couple, the man casting a shadow over the woman, and realized that this could embody a story of how the couple faced some devastating challenges in their lives and survived. My next thought was that this could be the way to tell the story of invisible illness and its impact on individuals, their families and friends. I began to see how writing a good story with engaging and passionate characters would reach a wider audience than the limited one my nonfiction writing (and speaking) had reached before. Writing this book included the very essence of what it is like to live with chronic illness and remain creative while experiencing its random and unpredictable episodes. The book grew in spite of my physical limitations and never being able to write on a schedule. What surprised me most was the development of the Fioris’ friendship with Lauren and how it grew despite her mounting health challenges. They became intimately involved in helping Lauren find answers to her symptoms and life challenges, even including her as a beloved family member. Their compassion was very touching to me. I was also surprised by how little medical professionals know about Lupus and other invisible illnesses and how rarely they look for these diseases when presented with ambiguous symptoms. As I interviewed and met others with invisible illnesses, I was surprised by how ubiquitous my experience was. In researching this book, I came to have deeper respect for those medical professionals that never lose their compassionate connection with their patients. Robert Frost said, “No tears in the writer, no tears in the reader. No surprise in the writer, no surprise in the reader.” I can truly say as I wrote this novel, and as I read it over, there were still tears and surprises. How has your work as a poet influenced your fiction writing? Through my poetry I have always hoped to connect with the unearned challenges life brings us and embrace new perspectives and constructive alternatives to coping. Writing Shatter My Heart has allowed me to do this in fiction as well. In my poetry I use imagery and sensual experiences to bring the reader into an intimate connection with the words. I think I was able to carry this over to my novel. Writing poetry also has enhanced my fiction work with a sense of rhythm and pace that can be mesmerizing as it captures the reader’s attention and changes their breathing. I have many projects in the works including a sequel to Shatter My Heart which will answer many of the enthusiastic questions I have received from readers who want to know more about the characters and their lives. I have finished compiling a book of meditations written by my sister. Church of My Heart will be released next month. I am also in the process of preparing Beagle Blues about the adventures of a little beagle who gets into everything with an exuberant innocence. When completed I will offer this book to rescue groups, vets and others to mitigate some of the cost of caring for abused or abandoned dogs. And I am completing my new collection of poetry which I hope to have ready for publication later this year. Other projects include contributions to anthologies, my website and blog, and public speaking and workshops on the two topics prominent in my life—writing and coping constructively with chronic illness. I love feedback from my readers and would appreciate their comments on my website at ThelmaGiomi.com.